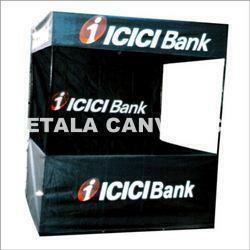 We are a leading Wholesale Trader of folding kiosks canopy, promotional kiosks canopy and promotional canopies from Chennai, India. Aiming at optimum patron-satisfaction, we are providing Folding Kiosks to our clients. The offered products are highly suitable for the commercial and promotional applications owing to their exclusive design. The offered range is manufactured in accordance with the clients' expectations making use of ultra-grade raw material. All these products are highly demanded in the market owing to their excellent design and attractive colors. 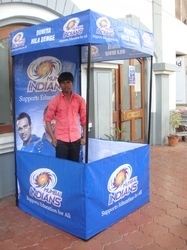 For our esteemed clients, we are having a wide range of Promotional Kiosks in our store. We manufactured these products keeping in mind their exact specifications. Ultra-grade raw material is used for manufacturing these products so as to ensure their excellent performance at the patrons' site. Moreover, we are offering these products at market leading prices with assurance of timely delivery. Our range of promotional canopies features exclusive design with an appropriate space for the company's name. These canopies are light in weight and easy to install. Made from quality fabric, our promotional canopies can withstand adverse weather condition and are completely weather proof. 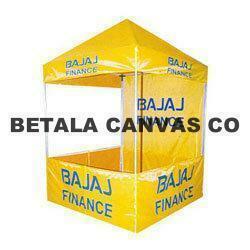 Looking for Promotional Canopies ?